How Is Regional Anesthesia Used During Surgery? Regional anesthesia is a method of pain prevention for surgeries and procedures. In regional anesthesia, only the area of the body that would feel pain is numbed, allowing the patient to have the procedure while awake or while sedated but still conscious. Spinal or epidural blocks are examples of regional anesthesia. They are injected near the spinal canal to block sensations in the lower body or limbs. Regional anesthesia is different from general anesthesia, which works on the entire body, not just the surgery site, and the patient sleeps through surgery. It differs from local anesthesia in that a larger region of the body is numbed. One benefit of a regional anesthetic is the patient can be consciously sedated or be fully conscious. A C-section is an example of a procedure performed with the patient awake, with regional anesthesia (epidural) used to control the pain of the surgery. The patient can feel things above the abdomen, and she is able to carry on a conversation and see her newborn immediately after birth. Epidurals and other types of regional anesthesia are typically provided by an anesthesiologist or a nurse anesthetist (CRNA). Depending on the need, the anesthesia may be given with a needle or a needle may be used to insert a flexible catheter line through which anesthetics and other medications can be administered as needed. may be used to insert a flexible catheter line through which anesthetics and other medications can be administered throughout the procedure. Regional anesthesia is provided by injecting specific sites with a numbing medication that works on the nerves of the body, causing numbness below the injection site. If you are having hand surgery, your anesthesia may numb your entire arm and hand, or the numbness may be mostly limited to your hand. Epidurals or spinal blocks are given on your back. 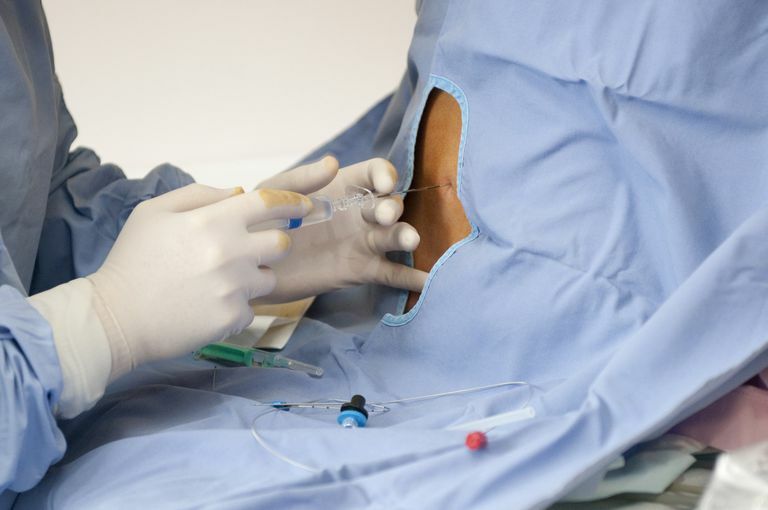 With an epidural, a flexible epidural catheter is placed in position with a needle and taped in place. Medications can then be administered as needed through the catheter to block pain. Spinal blocks are given with a needle to the spinal sac, with the medication entering the cerebrospinal fluid. It uses a finer needle than an epidural. A peripheral nerve block may be given in the shoulder-arm, back, or leg regions. By choosing the site, different levels of the limb may be numbed. The anesthetic solution doesn't enter the nerve but is injected near it. A nerve stimulator or portable ultrasound device might be used to locate the nerve that is the target. Specific nerve blocks include the brachial plexus block, paravertebral block, femoral nerve block, sciatic nerve block, and popliteal nerve block. Thoracic surgery, especially for pain control after procedures on the chest or esophagus. Regional Anesthesia for Surgery. American Society of Regional Anesthesia and Pain Medicine. https://www.asra.com/page/41/regional-anesthesia-for-surgery.